Visiting the 1940s Chicago of the Schiavon and the McCormick families, we can see the beginnings of a decade of change for a people who have been living in the midst of the Great Depression. World War II has begun barely the year before with Germany’s invasion of Poland, followed subsequently in the spring by invasions of Denmark and Norway. Franklin Delano Roosevelt is campaigning for his third term as President. Unemployment, which had topped 20% in the mid-1930s, is now on its way down, though it hovers at a dramatic 14.6% with over 8 million people still out of work. The minimum wage is 43 cents an hour, and the average worker makes about $1,300 per year. It costs 3 cents to mail a letter, 8 cents for a loaf of bread, and 34 cents for a gallon of milk. And yet, hope and sentimentality reign. It seems that everyone is humming and jiving to the number one song on the charts, Glenn Miller’s In the Mood. And lest there be too much levity, there is still lots of room for epic romance and nostalgia in Gone with the Wind, which wins 10 Academy Awards, including Best Motion Picture of 1940. 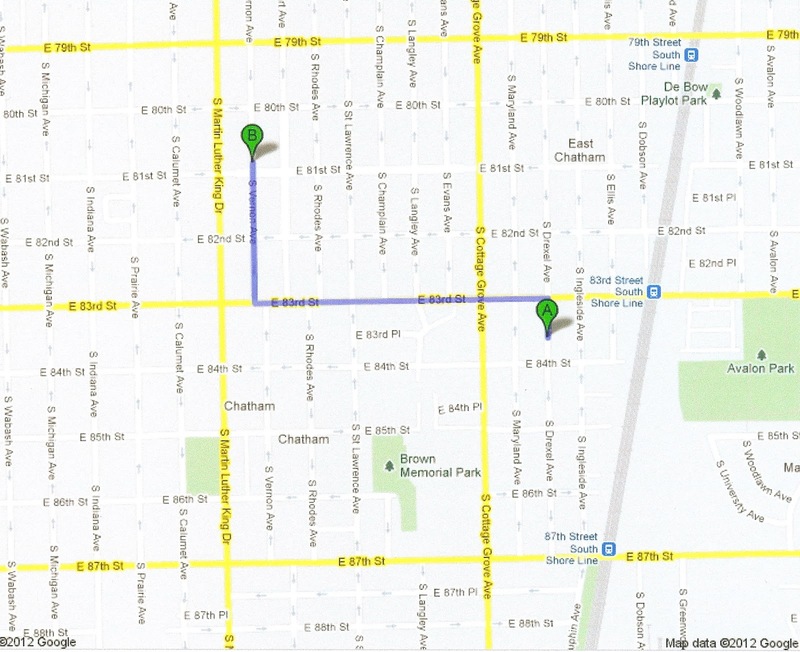 We find Ralph and Alice (McGinnis) Schiavon and their children, Tom and Joan, living at the old McGinnis home on 8336 South Drexel Avenue (Point “A” on the Google map above). They now own the home, valued at $9,000, about $3,000 above the average house of the day. Ralph, at age 42, is a tax counselor in private practice. He states that he worked all 52 weeks in 1939, yet he does not report any earnings from it during that time. He does tell census taker John Quigley, however, that he made some $50 or more from sources other than the income from his (current) job. Had he been working in some other capacity prior to 1940 and recently gone into private practice? 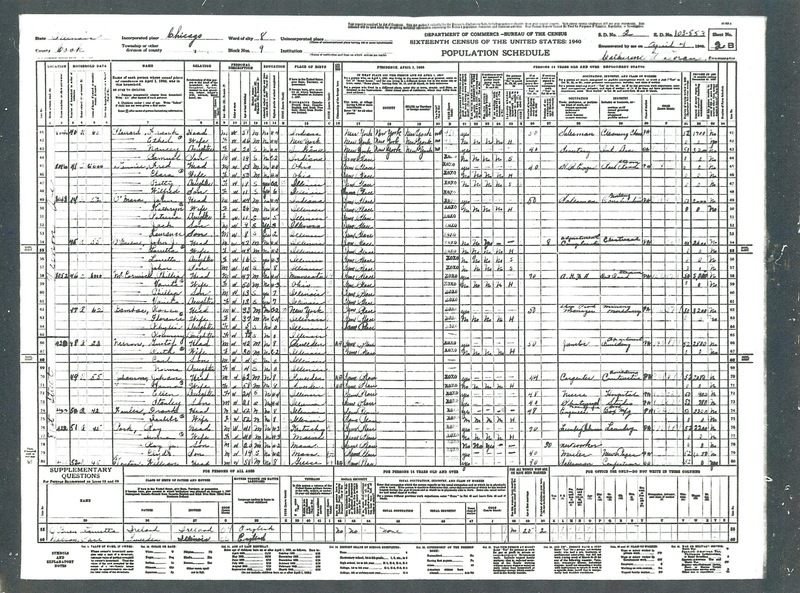 Or was the “zero” salary simply an oversight by the census taker? We may have to search a little more to find out. My grandfather Ralph also tells the census taker that while the highest education Alice had was high school, he only got as far as the sixth grade. Being a proud man, this admission must have been somewhat uncomfortable for him, but what he does not say is that he managed to go to night school to study accounting after serving in the Navy during World War I. Too bad there is no space on the census form to indicate determination. 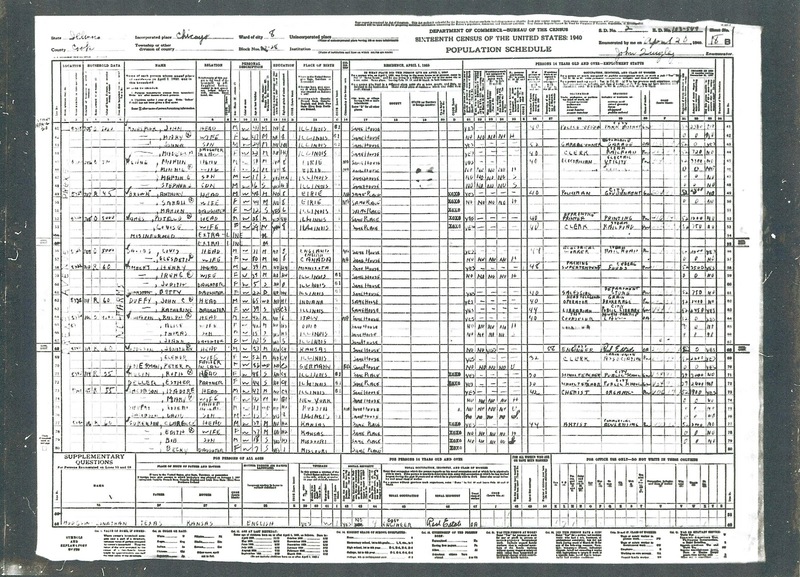 Ralph, who is noted on the census form as the informant (see the “x” by his name), gives his age and that of his wife Alice as 42. Young Tom and Joan are listed as 15 and 10, in high school and fifth grade, respectively. But there are some discrepancies. Alice was not 42 but 44 years young. My mother was actually 11 – and in the sixth grade. Ralph refers to my mother as “Joann.” It is one of her nicknames, the other being “Joie.” Truth be told, she is not fond of either and for that reason years later gives my sisters and me names that typically would not have nicknames attached to them. In fact, I think that just about the only thing she really likes about her name was that it gives her something in common with Saint Joan of Arc, to whom she has a great devotion. Barely under a mile and about a 20 minute way away are Alice’s sister, Benita (McGinnis), her husband Phil McCormick, and their own two children, Philip Jr. (“Buddy”) and Benita Jane (“Jane”). 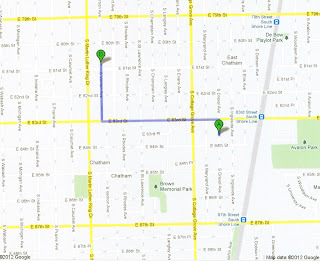 They, too, own their home at 8052 Vernon Avenue (Point “B” on the Google map above), which is valued at $6,000. Unlike the Schiavons, they have been living in their home for at least a decade. Though Benita is the informant here, the census taker, Catherine Doran, misspells her name and that of her daughter as “Vanita.” Perhaps the poor census takers had so many homes and people to cover in a day that they simply took names down phonetically to save time. Unlike many women of her time, Benita does not lie about her age, though at 50 she is a full three years older than her beloved Phil, 47. Her children, Bud and Jane, are both (nearly) 13 (they would have their birthdays a month later) and are in the seventh grade. Though it would appear here that Bud and Jane were twins, they were not. In fact, both were adopted from different families but at the same time, hence the same birthdate. Jane’s mother was a young German-American farm girl from Wisconsin, while we do not have information on Bud’s birth family. Like her younger sister Alice, Benita is what today we would call a “stay-at-home mom.” In reality, she and her sister do not stay at home much but keep busy visiting relatives, friends, and engaging in their various pursuits: Alice with her stamp and doll collections, and Benita with her painting and writing. Phil works for the railroad – a healthy business during the Depression, and the railroad has been good to him and his family. He worked 50 weeks last year – likely having taken two weeks off for vacation – and made a higher-than-average salary of $5200. 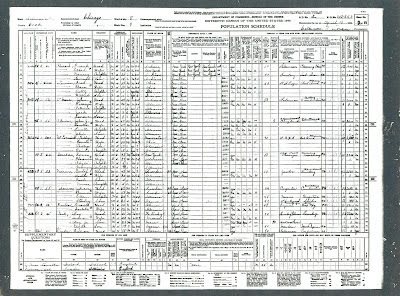 Mary Jane (Gaffney) McGinnis, the anchor of this family, does not appear in the census with either of her daughters. Now 81 years old, she has been in failing health for a couple of years and is suffering from kidney disease. Her sister, Elizabeth, known as “Lyle,” has been gone for six years now, having died in 1934 of heart disease. 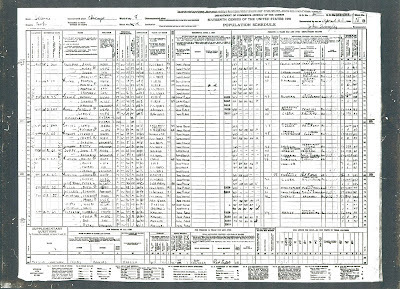 Census records for April 1940 do not show Mary Jane residing with her son, John, and his family on Minerva Avenue in Chicago, or with her sisters, Maggie, Agnes, and Delia, on Woodbury Avenue in Cleveland. It is unlikely that she would be living with her son, Eugene, whose has been changing jobs and apartments for some time. A more plausible theory is that Mary Jane has been living with one of her daughters but is in hospital at this point. Which hospital, though, is the question, as she does not appear in the census at Woodlawn Hospital, only a few blocks from her daughters.